In last post, I mentioned Hadoop, the open source implementation of Google’s MapReduce for parallelized processing of big data. In this long National Holiday, I read the original Google paper, _MapReduce: Simplified Data Processing on Large Clusters_ by Jeffrey Dean and Sanjay Ghemawat and got that the terminologies of “map” and “reduce” were basically borrowed from Lisp, an old functional language that I even didn’t play “hello world” with. For Python users, the idea of Map and Reduce is also very straightforward because the workhorse data structure in Python is just the list, a sequence of values that you can just imagine that they are the nodes(clusters, chunk servers, …) in a distributed system. Then we introduce the idea of “big data” that the string is too huge to one master machine, so “master method” failed. Now we distribute the task to thousands of low cost machines (workers, slaves, chunk servers,… in this case, the one dimensional array with size of 6, see Line 11), each machine produces parts of the job (each array element only capitalizes a single letter in sequence, see Line 12-14). Such distributing operation is called “map”. 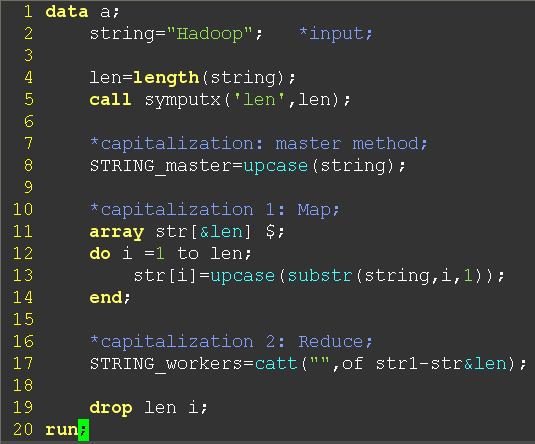 In a MapReduce system, a master machine is also needed to assign the maps and reduce.